Ideally, affordable, appropriate, and adequate housing should be available for people of all abilities, incomes, lifestyles and household sizes. In addition, housing should be close to everyday needs such as jobs, shops, schools and recreation - this helps to lower household costs by reducing the need to rely on private cars to get around. Meeting regional housing needs requires an integrated and collaborative approach with member municipalities, other levels of government (Federal, Provincial & First Nations) and numerous non-profits who have an already established track record addressing housing issues in the RDN. Raise Awareness about housing needs and actions that the RDN and other organizations are taking to increase housing choice and affordability in the region. Provide Information on housing resources for community members, housing advocates and providers, developers, employers and RDN member municipalities. The RDN acknowledges that definitions for different housing terms may vary from one agency/organization to another. Please Click Here to view definitions from the BC Housing Glossary and other BC Housing reference material . These definitions are provided to enable a general understanding of the terms used in this website. The Community Housing Continuum is commonly used as a model to understand housing affordability. It shows a range of housing and tenures, inferring that there are options for people to move along a continuum of housing types ranging from Government-Subsidized Housing to Market Housing. Studies prepared by the RDN and research from Canada Mortgage and Housing Corporation (CMHC) and BC Housing show that there is an ongoing and growing need for affordable housing throughout the region. This includes housing to meet the needs of specific groups like seniors, youth, low income families and those with disabilities. The following provides a list of research and studies documenting the need for affordable housing. RGS Goal 6. Facilitate the Provision of Affordable Housing - Support and facilitate the provision of appropriate, adequate, attainable, affordable and adaptable housing. Click here to read a summary of how the RGS supports Affordable Housing. On January 25th 2011, the RDN Board directed staff to proceed with several actions in a Housing Action Plan that identifies how the RDN can support and facilitate the provision of appropriate, adequate, attainable and affordable housing throughout the region. The Plan focuses on effective actions that can be accomplished using existing budgets and staffing resources. The first phase confirmed that the supply of affordable housing throughout the region falls short of meeting the needs of those least able to afford adequate housing. The second phase addressed solutions to the housing needs identified in the first report. The findings and recommendations of this report were used to guide the RDN's 2010 Housing Action Plan. The Housing Incentives document lists incentives provided by the RDN (as well as member municipalities and other levels of government) to encourage the creation of different types of affordable housing by non-profit organizations and market based developers. The RDN does not directly provide services to meet the needs of those facing homelessness in the region, however we do provide support to those already doing a good job of providing these important services. This includes redistributing funding received from other levels of government to organizations with a mandate to end homelessness. On June 26, 2012 the RDN Board allocated 60% of grant funding received from Vancouver Island Health Authority (VIHA) for Capacity Building to end Homelessness to the City of Nanaimo and SOS on behalf of the Oceanside Homelessness Task Force. The funding was distributed on the basis of population in School Districts 68 and 69. The remaining 40% was set aside in a reserve fund for distribution at a later date. As of November 2014, the RDN Board had allocated all of the money in the reserve fund to various programs and projects to address homelessness. The staff report below provides more information for how the money in the reserve fund was distributed. Several of the RDN's member municipalities, non-profit and faith based organizations have been leading the way with their collaborative efforts to both end homelessness and implement initiatives to support the creation of affordable housing. This document lists incentives provided by the RDN and Member Municipalities (as well as other levels of government) to encourage the creation of different types of affordable housing by non-profit organizations and market based developers. 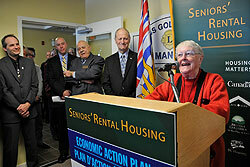 The City of Nanaimo is involved in several initiatives to help end homelessness. This includes working with other levels of government and non-profit organizations to facilitate the provision of supportive housing and other services to meet the needs of those facing homelessness. The NWGH is a committee of government, non-government agency and community representatives who work to address homelessness in Nanaimo and surrounding areas. The group functions to advise and support the work of non-profits to provide housing and services to meet the needs of those facing homelessness, including administering funding. Formed by the City of Parksville in 2010, the mandate of the Task Force is to address homelessness and issues related to homelessness in School District #69, including the City of Parksville, Town of Qualicum Beach and surrounding communities in the regional district. The Task Force provides funding and input to the work of non-profits working to address homelessness. 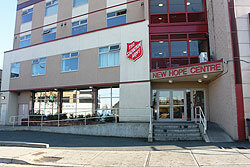 Through The Salvation Army, the Task Force operates an extreme weather shelter from November 1 to March 31. For a list of other organizations working to end Homelessness and meet regional housing needs Click Here. Watch this video to understand the impact that affordable homeownership has on the lives of those with smaller incomes. This video shows how organizations like Habitat for Humanity make home ownership more accessible for those with smaller incomes.